Traceroute - How does it work? published Sept. 10, 2012, 6 p.m.
Anyways, what Traceroute does is, it sends a UDP packet to the destination taking advantage of ICMP’s messages. So let’s take a brief look at what ICMP and it’s messages are. Traceroute uses the first two error-reporting messages – Destination Unreachable and Time exceeded. Now that the introductions are done, let’s dive into the juicy parts, starting with an image of the process’ overview. The steps that have occurred uptil now, occur again and again until the destination has been reached. 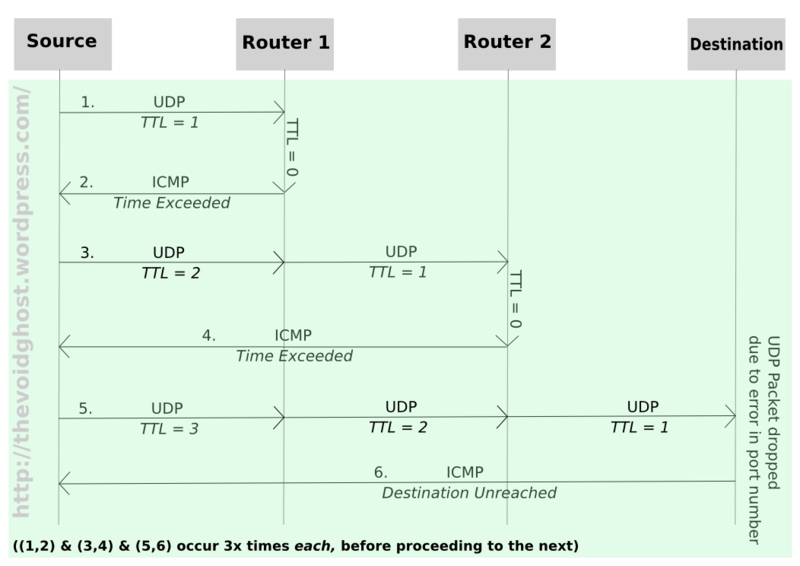 The only change that happens is that the TTL is incremented by 1 when the UDP packet is to be sent to next router/host. But, the UDP packet used by Traceroute specifies the destination port number to be one that is not usually used for UDP. Hence, when the destination computer verifies the headers of the UDP packet, the packet gets dropped due to improper port being used and an ICMP message (this time – Destination Unreachable) is sent back to the source. And here’s an example output of traceroute from my machine to Askubuntu. The stars in the output mean that they are filtered, most likely by a firewall. After the 15th hop all further hops until the destination is reached are filtered, hence, traceroute was unable to find the route.